Everything old is new again. It was revealed this week that Warner Bros is currently considering rebooting The Matrix and making a new series of movies. Keanu Reeves had hinted at the possibility of returning for a fourth Matrix for some time. However, WB appears to be interested in forging a new path. In a world full of endless remakes, sequels and reinterpretations, a Matrix re-imagining seems wholly unnecessary. So let's explore why The Matrix needs to be revisited, but not rebooted. It shouldn't come as much of a surprise that a film as revered and respected as The Matrix would get a reboot. Even a film as treasured as The Lion King is getting a live-action do-over. So let's explore why The Matrix needs to be revisited, but not rebooted. This apparetnly all started when Matrix producer Joel Silver approached Warner Bros with the idea to expand the onscreen Matrix mythology. While the idea to produce new Matrix movies may seem like an exciting one, it's no secret the two Matrix sequels weren't very well-received at the time. While The Matrix is still considered a modern classic, the sequels don't enjoy the same reputation. 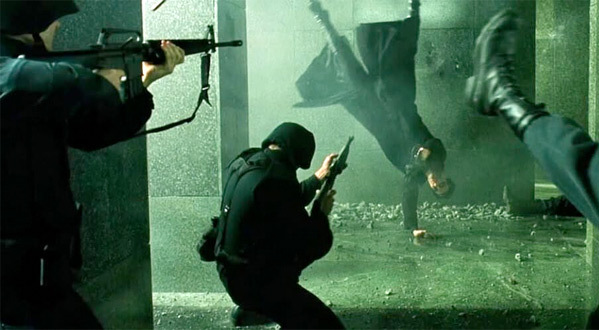 The Matrix Reloaded fared somewhat favorably with critics at the time, but most fans thought the movie was often muddled with lengthy, expository stretches. The Matrix Revolutions fared much worse with critics and audiences. For the most part, the sequels are considered a disappointment, especially in comparison to the original film. On the surface, that would make rebooting the franchise easy. After all, Desson Thomson called Revolutions in his review, "a chronicle of banality". He compared the sequels to the much-maligned prequels of another popular franchise, saying Revolutions tries to "imitate the qualitative tailspin of the Star Wars series." The Star Wars prequels are an apt analogy. They were ill-received, trashed by critics and loathed by fans. Instead of rebooting, however, Disney and Lucasfilm decided to expand their rich Star Wars mythology. It has so far resulted in a very successful spin-off film, Rogue One: A Star Wars Story, which was a huge hit both critically and financially. Disney has been smart to preserve the legendary Star Wars lexicon, though. By rebooting The Matrix, Warner Bros is missing out on an opportunity to tap into a pantheon of stories just waiting to be plugged into. While the sequels received a mixed reception from fans and critics alike, The Animatrix was almost unanimously praised. It featured several short films done in different anime formats that focused on characters new to the series. Every story was told not only in a different animation style, but a different storytelling style as well. If anything, The Animatix proved the concept of The Matrix, such as Star Wars, has a wealth of storytelling potential. Audiences are familiar with these movies, and the set-up is pretty simple. The Matrix is a computer-generated simulated run by machines while humans are wired into it, all the while thinking the simulation is real. You could do any kind of story with that initial set-up. A reboot, unlike a sequel, would have to explain that concept all over again. This is why audiences and fans tire of the comic book origin story. Critics and fans complained The Amazing Spider-Man was redundant, exploring the Peter Parker origin story twice in ten years. The next Spidey film, Spider-Man: Homecoming, will wisely avoid the origin altogether. Audiences know Peter Parker's story: uncle gets shot, gets bitten by a radioactive spider, etc. No need to rehash it again. The Matrix, like a lot of first films in any franchise, spends a lot of its time explaining the universe. Much of the film's first and even second acts are dedicated to characters such as Laurence Fishburne's Morpheus giving expository speeches explaining the rules of the Matrix. The same happens in almost every science fiction film with a high concept, such as Inception. What would make a Matrix sequel – not a reboot – so refreshing is that it wouldn't need to re-explain the entire concept. Sure, some audiences might need a refresher, but that could occur in the opening credits. The Incredible Hulk smartly condensed Bruce Banner's origins in the film's concise title sequence. With that out of the way, the new film could jump into the narrative and hit the ground running. There is nothing wrong with the idea of reboots. The Batman franchise was in desperate need of a reboot in Batman Begins and it ended up saving that franchise. Similarly, no one could have predicted how vital and important a James Bond reboot ended up being for the 007 franchise. However, as The Amazing Spider-Man proved, not all franchises need them. A reboot for The Matrix feels like a lazy oversimplification for the franchise. All it does is further Hollywood's continuing trend to latch onto nostalgia like someone unwilling to unplug from the Matrix. Almost everything from the 90's and early 00's is getting a reboot now. In a week, Saban will release the new Power Rangers reboot. The Teenage Mutant Ninja Turtles got a reboot a couple years ago to disappointing results. This past week, a remake of The Fly was announced. Yes, the Jeff Goldblum version was a remake in itself, so that's less grating on the nerves. What's more grating is the current trend of Hollywood just about rebooting everything. Den of Geek has 116 movie reboots and remakes currently in the works. You heard right. Even Ace Ventura is getting a reboot. Hollywood knows no bounds sometimes. Not every movie necessitates a reboot. Of course (we all know this, right?). What film studios need to intrinsically understand is what movie needs a clean slate and what movie doesn't. A movie franchise like Batman needed one, given how Batman & Robin temporarily killed the franchise. The James Bond franchise was getting out of control with too much style over substance. The Matrix doesn't need a reboot, no matter how divisive and polarizing the sequels were. It just needs to be revisited. Nearly 15 years after the Matrix sequels, opinion has even changed somewhat. At the time, they were considered huge disappointments. However, The Matrix Reloaded was actually received very well by critics. Richard Roeper called it "a sequel that soars to places only hinted at in the original." In the time since the sequels were originally released (in 2003), it appears more and more people have warmed up to them. Noel Murray wrote an excellent piece for The A.V. Club defending the sequels. In the piece, Murray writes that, "The Matrix Reloaded honors the original's inquisitive spirit and amped-up action." It was always going to be a challenge to make better films. The sequels had admittedly lofty expectations coming after the game-changer that was the first film. Instead of retreating old ground, The Matrix Reloaded expands the mythology even further. It's a rather cerebral insight and rumination on fate and the futility of our existence. If The Matrix was about forging your own destiny, The Matrix Reloaded challenges you to ask what that destiny actually means. It's not a simple film, filled with loaded exposition and chunks of screen time where characters, such as The Architect, spill out the Wackowski's philosophical ideas in complicated, sometimes abstract strokes. It is a very heady film, trusting the audience will unpack what the film has to offer. Audiences were probably not expecting such an intricately cerebral movie after the one-two action punch of The Matrix. If you're patient, there's a lot of complex, interesting and engaging material to be found in The Matrix Reloaded. I can't fault the Wackowskis' for delving further into the philosophical richness that made the concept of The Matrix so alluring in the first place. It's a concept that can still be mined even without hitting the reset button. Warner Bros will probably move ahead with its planned reboot of The Matrix regardless. If and when it happens, Warner Bros needs to look at what made The Matrix so successful in the first place. The original was such a resounding success because it was so unique and fresh at the time. The ‘bullet time' effect – which almost every major action movie has tried to copy since - was revolutionary. It was exciting and it was original. The Matrix was a confluence of all the right elements coming together. If The Matrix is going to be rebooted, don't cling to what made it successful before. Come up with a new, bold approach with a brand new story and perspective. Inventing a new ‘bullet time' effect will be hard, so don't bother. Just focus on telling an exciting, fresh and original science fiction tale set within the backdrop of that great concept. The Matrix is a modern classic because it felt so new at the time when it was first released in 1999. It doesn't feel as new now, given the amount of imitators that have since tried to mimic the film's success and ideas and visual effects. If the powers that be feel the need to reboot The Matrix yet again, just remember that with a great concept comes great responsibility. Don't simulate what came before. Don't remake the original. Audiences are smart and they can see when a good idea is done badly. Like the Matrix, a glitch will just cause deja vu. What do you think of this news? Do you think The Matrix needs to be rebooted?